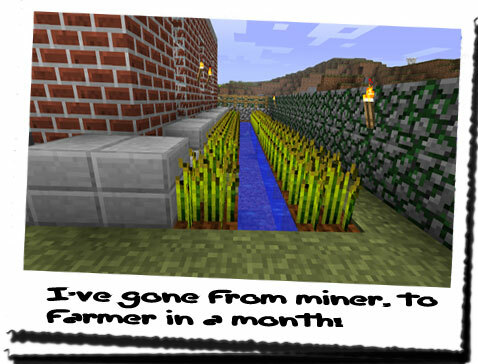 Diary of a Miner: Day 71: The cow, the wheat and the dye! Day 71: The cow, the wheat and the dye! I woke up late this morning. That little "nap" I had yesterday afternoon didn't seem to help at all! But the rest will always do me good, especially if I'm supposedly going back out again. Chances are it'll take a few days to get a response from THEROS, so I need to prepare for what I assume will be an extended note with the emphasis on "go back and destroy them!"... I don't mind so much, so long as I get some answers to the questions I asked. I started off the day by repeating what I did yesterday. Taking a bucket out, I went into the pen, to be greeted by the cow! It actually walked up to me and nuzzled my arm! I'm really surprised how it's taken to me... Maybe I just have a way with animals. After five minutes, I had a bucket full of milk, and I went to take it inside. Before I did, I placed it to one side of the door and went back inside the pen. The bucket of water was empty already, so I went down to the freshwater pool and refilled it. Putting back in the same place, the cow came up to me and began drinking as I left. I really need a name for her rather than "cow"... Going back to the door, I picked up the bucket of milk and went inside. Like before, I poured a small bowl out and drank it, before repeating this and giving it to Chiron. He seemed to love it, and I wasn't complaining either! It was a great change from boring water, and a whole lot better for you too. As I put a cloth over the milk and placed it in the corner, I looked out of the West window to see a perfect row of fully grown wheat! Brilliant! That was my next job. Might make some bread while I'm at it as well. Half an hour later and I had ten sheaves of wheat! Carrying it all back to my house, I placed it into the chest, leaving a few pieces of wheat out. I was going to spend another hour or so making some bread. I always loved the smell of freshly baked bread, and it would certainly cover up the smell of damp and mold that was currently infesting this house! I crushed the wheat to make flour, and then added water and some salt left over from evaporating seawater and began kneading. After a few minutes, I placed it into the stove and went down and decided to go down into the library. I know I had seen a book somewhere that had some good recipes involving milk, and even if I couldn't find them, there was bound to be something of interest down there. After twenty minutes, I returned to the house with a book. It wasn't the book I was intending to find, but it was interesting nonetheless. It was all about engines, and how they worked. I had picked it up out of interest, mainly as a result of the giant hunk of iron stranded against my wall! I was wondering if it was possible to get the engine back up and running, and maybe use it as a mobile base. I had more or less come to the conclusion that I was never going to see the house again. All that work, all that effort. Admittedly very little in the way of mining had been achieved, but maybe if I could get the ship working, I could go off to a totally new area and never be in contact with anyone ever again! Then again I couldn't see THEROS allowing that... As I got closer to the top of the ladder, the smell of fresh bread began to waft down, and all thoughts about HoN Co., the house and THEROS disappeared! It would nearly be ready and I was starving! The bread is delicious! As usual... I never thought of myself as a good cook, but with nothing to compare it to, I suppose it wasn't that bad. I had a few slices, and then I got an idea. It was something that had occurred to me about a week or so ago. 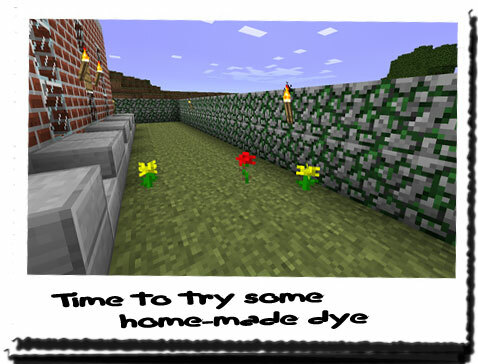 I had seen wildflowers everywhere, and I was wondering if it was possible extract a dye from them to dye cloth. I only had white cloth from the wool, and a few pieces of black from the black sheep. But it would be nice to have different colours, especially with some of the wildflowers being a deep red and sunny yellow! Going just outside of the house, I went down the side, and within a few steps I had already found the two colours I was after! After finally acquiring an orange block - and being strangely ecstatic about it - I decided to put away the "art kit" and establish some more serious matters. For one thing, I almost knew indefinitely that THEROS would ask me to return to the temple to destroy the last two portals that I knew of. That meant trying to figure out a path. Looking at the map, there were numerous ways i could approach it, the fastest obviously being to make another boat and row straight across. But this put me in a vulnerable spot because: A) I would be a sitting duck in a boat in the middle of a body of water, and B) There is no way I would get a boat to the water from where I was! I could do what I did last time and make it near the shore, however I had a plan to get mine back! It was probably still down by the beach area to the South of that little area where a hidden portal had been. Later, it turned out to expose a hidden entrance with a tunnel that took me to the place that started all of this off! I would probably have to stick close to the coastline almost all the time to ensure I knew my bearings, and to reduce the chances of being caught. I had to assume, for safety's sake, that the guards were still searching for me... 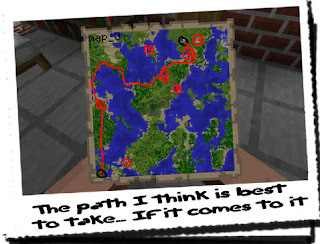 Looking at the map, there was only one path I could realistically take which was long and arduous, but reasonably safe. It would put me onto the landmass where the hidden portal was, and then hopefully I could take the tunnel all the way to the dirt hovel. This journey would take a few days to get there, but destroying the portals would take less than an hour. It would be best to destroy one portal, and then stand guard whilst it recharged, then destroy the last and run off back down the tunnel! Once back out the other end, go back to the beach and retrieve my boat, where I then take a short rowing trip back to the closest edge to the house, which was probably the stone beach. There! I think I was set! Day 72: HoN Co. will fall! I finally had a plan... Was it all for nothing? Day 66: Found the most epic of hiding places! Day... 62... maybe...? : Where am I? Island hopping without getting my feet wet! This land is riddled with portals! Day 58: Riddle me this...? Day 56: Heading off towards the rising sun!